Can you support people’s health while rejecting their bodies? The public health authorities seem to think so. Calls for the “prevention and elimination” of “obesity” are coming at us at unprecedented rates. Fatness – that is, fat people – are being blamed for just about everything vexing about modern life. Even the public health programs that acknowledge weight stigma don’t acknowledge their own stigmatizing messages. Fat people are told to solve the problem of weight bias, bullying, discrimination, and violence by disappearing. And many fat people are trying to disappear. In fact, people of all sizes are trying to disappear. The quest for a body that can disappear – disappear from the view of the stigmatizers – fuels a $60 billion weight loss industry. Americans are spending more money every year on trying to disappear than we spend on college. It must be pretty damned important to us. But no, the public health authorities protest, we are not trying to get rid of you, we are trying to get rid of your disease. You know, your FAT. Ah, but there is the problem, isn’t it? Because fat is not a germ, fat is not a tumor, fat is not a parasite. Fat is an intrinsic and essential part of our human bodies. Ah, but there is another problem, isn’t it? Because we can’t decide how much is too much. The public health authorities can decide on an arbitrary BMI, but it fails to predict who will be sick or well. It fails to predict longevity. It even fails to predict how much fat tissue someone has. But no, the public health authorities protest, it’s fine then to just try to minimize it. Ah, but there is another problem, isn’t it? Because people who are trying to minimize their fat are actually dying. Their treatment is so expensive that insurers try every tactic not to pay for it. So there really is a “too little” fat problem that begs the question, how much is the right amount? When there are people sick and dying of “too little” and “too much” fat at a wide range of weights, maybe there isn’t a global “right amount” of weight. Maybe it is an individual thing, inherited by each of us from our ancestors who survived a dazzling range of environmental challenges. Maybe we are supposed to be a diverse range of sizes! BMI is clearly a terrible proxy for health, but is there an “ideal” BMI that keeps a person safe from weight stigma? How much is the right amount of disappearing to keep from being a target of hate? How much of you has to disappear to qualify for insurance without being forced to participate in Weight Watchers at work? 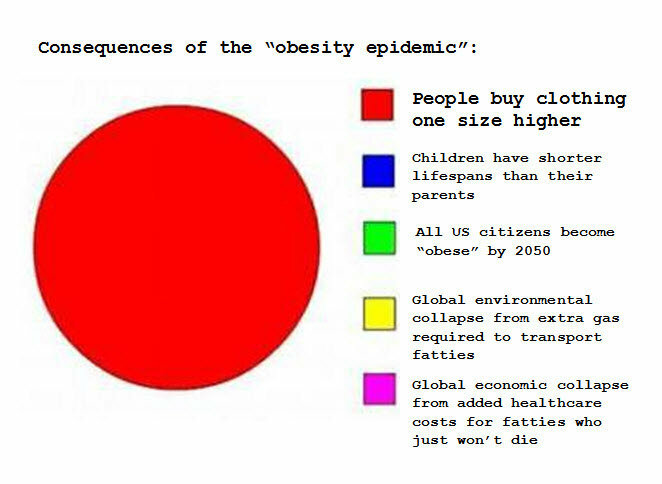 To keep you from being called a fatty during “Childhood Obesity Awareness Month”? To prevent a weight loss lecture when you go in to see your doctor for a strep throat? To keep you from being the one the other kids blame because there are no more cupcakes allowed at school? How much of you has to disappear to make sure you can get a knee replacement without having to first mutilate your stomach? To keep your school from sending your parents a failing “BMI report card”? To keep you from worrying that the state will remove your children from your custody? Disappearing is the road to death, not health. But it can seem like a good idea when your body is a target for the haters. And it is particularly difficult to untangle when the haters claim to be asking you to disappear “for your health.” Not only do people feel the hate, they feel the prohibition on naming it as hate, because it is delivered in the guise of something that is supposed to be good. Let us remember that we do not talk about “having” fat, we talk about “being” fat. We identify with our bodies, even more than our homes or cars or jobs. When there is a rejection of our bodies, we experience it as the most profound rejection, because we understand that no matter how much weight we lose or plastic surgery we get, we still identify with those original body images. Even weight loss surgery does not reliably make fat people thin people (rather than temporarily-less-fat people), and even while people are thinner they realize they are the same person as before. Listen to the language of the makeover and you hear the relentless drumbeat of, “I am a whole new person!” because in fact, makeovers are fairy tales and we all understand that. “I disappeared myself!” is a fairy tale, not a solution. Disappearing is a death – in fact, a murder. It is critical for the public health authorities to understand this psychological truth. When you hate fat, you hate a part of a person that they identify with. As a fat person, it is impossible not to perceive the hate in these messages. It is not a health-promoting sentiment. It is a violence that is being done, not just to fat people, but to anyone who has a part of themselves that identifies with fatness. That’s pretty much everyone these days, since fat is loaded with meaning in our culture. Fat is supposed to represent being ugly, needy, out of control, depressed, vulnerable and so on. Our culture teaches us to relegate these all-too-human feelings to the shadows of our psyches, to strive to be everything that “fat” is not. So people work very hard at not being “fat” – all those virtuous meals and workouts and sacrifices are designed to hold the things we fear at bay. But of course even if today you do not feel ugly, needy, out of control, depressed, and so on, there is still the lurking threat of those feelings emerging tomorrow. And here is the kicker: You are very likely to feel one of those feelings if someone stigmatizes you. You are very likely to “feel fat” if someone rejects or shames you. So the cycle continues – people being mean to other people, who translate the meanness into a problem with their bodies and blame their bodies. The problem, people, is meanness. The problem is hate. If you are a public health authority, you have power and you have responsibility. Even if it is the norm for all of us to hate and fear the feelings that are associated with fatness, even if it is the norm to feel pride in a thin body, you need more insight into your own professional and personal beliefs and how they are organized by the cultural and economic forces of your time. You need to understand these beliefs so you will do no harm. I ask you to stop running from or attacking what you fear. Listen to your public health messages with the ears of your fat loved ones and colleagues. Let them help you to understand how it feels to be hated and threatened. Can you really believe this is healthy for anyone? When you stop trying to make fat people disappear, you might be able to actually have a wonderful conversation about health. The Health at Every Size® model teases out the hate speech from the health speech. It protests asking people to disappear in the name of “health.” It asserts that people become healthier when they stop living in fear, when they have environments free of hatred, when they can use the energy that was going into the effort to disappear to instead care for the body they were taught to starve, imprison, surgically restrict, or run into the ground. It asserts that people become healthier when they SHOW UP. It is time for us all to refuse to disappear. Refuse the path of death. Care about, and care for, those who have felt rejected, inside you and outside of you. At any size, at every size, we are worthy. May we all SHOW UP and take our place at the table.